Where do I use my Warner Leisure Hotels voucher code? Find a code you would like to use from NetVoucherCodes, copy it and follow our link to Warner Leisure Hotels website. In the Choose a Break section, tell them where, length of stay, when, price range & break type. Finally, enter your offer code in the final box and click 'Find My Break'. Next, choose from your results, the price will be adjusted accordingly. Choose your break and continue with the booking process. "Request a brochure for free." Warner Leisure Hotels offer luxury rooms and breaks exclusively for adults at their 13 unique properties across the UK, each with its own distinct character and a rich variety of entertainment, dining, and accommodation. Pick a beautifully appointed hotel bedroom, or a stand-alone chalet for a little-added thrill and privacy, dine in award-winning restaurants staffed by first-class chefs, and use one of our Warner Breaks discount codes to book your time away for less. Breaks range from 3 to 4 nights, midweek or at the weekends, and many of the Warner Breaks hotels boast live shows and music, golf, pool, spas, tennis and more. With options for drinks inclusive breaks and seasonal specials like Christmas and Valentine’s Day, Warner Breaks provide the perfect getaway for grown-ups looking for a little time somewhere truly special. You can book an adult only break at a Warner Leisure Hotel in one of the 13 locations across the UK. Whether you are looking for a Country retreat or want to relax by the Seaside - you will find the perfect relaxing hotel at the locations available. You can book your warner leisure hotels break in the following locations: Cheshire, North Wales, Somerset, Herefordshire, Berkshire, North Yorkshire, Nottinghamshire, Isle of Wight, Suffolk or Hampshire. All Hotels are located in beautiful surroundings and offer the perfect opportunity for you to discover parts of Britain that you have never seen. Stop over for a couple of days or a full weeks holiday, you won't be disappointed. There are many UK offers and deals ready to take advantage of in the warner hotels special offers section. With savings of up to 50% on your next break, you can relax, unwind and enjoy more - knowing that you have booked a bargain break, giving you more money to spend while on holiday. They often have last minute breaks available, so if you can get away soon, then there may just be the ideal offer for you to book and then go and explore. Whether you want to relax or go on adventures whilst on your stay, Warner Hotels offers the best of both worlds so you can make the holiday perfect for your needs. They have seasonal offers available throughout the year such as Festive Breaks at Christmas or Romantic Breaks for Valentines, be sure to keep your eyes peeled for the current valid offers available on NetVoucherCodes.co.uk. Book a Warner Holidays late deal today and save £££'s on your break. With a Warner Holidays last minute booking you can enjoy all the benefits such as fine dining, live shows and plenty of activities to keep you occupied like taking a dip in the pool, relax in the spa, maybe get a little competitive with a game of tennis, long walks through the glorious gardens and much more. There is so much to do, whether you are the energetic type or whether you like to chill out whilst away, you will find the perfect activity to suit you. By booking late, you can be sure of a great discount too, so be a savvy holiday saver and find a great deal today in the special offers section at Warner Holidays. Call 0330 100 9774 or use the FAQs section. You can cancel your stay with Warner Leisure Hotels at any time prior to your stay, however, you will need to notify them in writing with plenty of notice and will be cancellation charged fees. Is there parking available at your hotel? All of Warner Leisure locations have easily accessible parking onsite and disabled parking facilities available too. Warner Leisure Hotels provide adult breaks in one of 13 hotels, take your pick and be prepared to enjoy some of the country’s most beautiful settings. Whether you choose to take a leisurely stroll around one of Warner's historic country houses or dip your toe in the sea near one of their coastal hideaways, you can rest assured knowing all Warner Leisure breaks are an opportunity for you to create memories and will make you want to return time and time again. Discover their range of hotels in gorgeous locations and their variety of breaks and entertainment in store that'll make you fall in love with Britain. 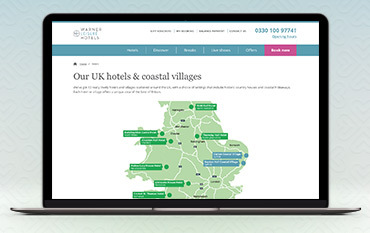 Visit their website now and use our Warner Hotels voucher codes to save money on your stay! We are constantly on the hunt for Voucher Codes for Warner Leisure Hotels to help you with your money saving. Our experts check dozens of sites for secret codes including NHS discounts, student sites & social media channels saving you time & money!